The Moe-Latrobe Valley Jazz Club (MLVJC) began on 12th September 1993 when Merv Burrage called a meeting of jazz lovers at the Gala Ballroom to form the club. The format for the club was for its activities to present jazz music rather than performing, even though there were musos amongst us. The format would include monthly functions with live bands, dancing, an annual ball and other events all with a jazz flavor. functions, and over the years it has become a happy meeting place for mature people who enjoy jazz music, a bit of dancing, and a good time. New members, visitors and guests are always welcome. Merv Burrage had many visions of how life could be improved for the residents of Moe and the wider Latrobe Valley community. One of these visions was to establish a Jazz Festival and a Jazz Club in Moe. The attributes that set Merv apart from other visionaries was his foresight, passion and determination to realise those visions. Establishing a Jazz Festival and a Jazz Club in Moe was no exception. disappointed with the response they received. Undaunted Merv approached members of the Valley Jazz band who agreed to support him. suggested Tom Davey be approached to fill the role of Secretary / Treasurer. Bill Boulton agreed to be a member of the Committee on a temporary basis. Merv had three other people in mind to become members of the Committee; they were Shirley Westerberg, Leigh Dodd and possibly Terry Roney. 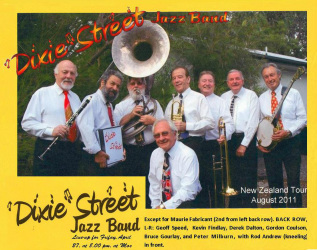 Committee to run a Jazz Festival in Moe. The rest is history as the Moe Jazz Festival, later to become known as the Moe Music Festival is still running 20 years later. of a Jazz Club in Moe. He set about lobbying local Jazz enthusiasts and eventually called a meeting on 12 September 1993 at which a Committee was elected to establish and run a Jazz Club. Once again the rest is history with the Moe-Latrobe Valley Jazz Club still running successfully today.